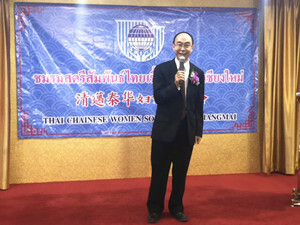 On 9 December 2018, Consul General of China in Chiang Mai Mr. Ren Yisheng attended the hand-over ceremony of the Fourth Concil of Thai-Chinese Women's Society in Chiang Mai. 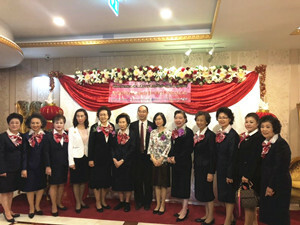 Chairperson of the Advisory Group of Thai-Chinese Women's Society in Thailand Ms. Chen Shuqin, newly-elected chairperson of the Thai-Chinese Women's Society in Chiang Mai Ms. Zheng Xiuyun and around 200 representatitives of Chinese associations and women's society in Chiang Mai were present. Ren Yisheng congratulated the newly elected council, appreciated their efforts to be self-independent and devotion to the society. He also hoped that under the leadship of the council, women in Chiang Mai will make greater contributions to the economic and social development of Thailand and the friendly cooperation between China and Thailand.